In May, 1997, Randy and Helen Baldwin eagerly welcomed their third child, Jeffrey. But eight weeks after Jeffrey's arrival, life took a completely unexpected downward spiral into the depths of shock and despair when Jeffrey was diagnosed with Spinal Muscular Atrophy (SMA), a rare, progressive genetic neuromuscular disease with deadly ramifications. Faced with the nightmare that their baby was expected to die within two years and that there was no treatment or cure, Randy and Helen took their faith in God to a higher level and embarked on a quest to defy SMA and its stranglehold on their precious baby's life. They sought the expertise of alternative practitioners and other SMA families, relentlessly relying on prayers for Jeffrey's health and comfort, and for strength, courage, and wisdom for themselves and their family. 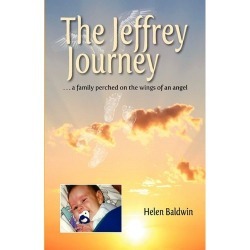 The Jeffrey Journey, based on Helen's notes, is the story of how one family rose to the challenge of caring for a dying child as they also realized the countless blessings left by their angel. The Jeffrey Journey, is available now at Amazon.com and other internet retailers, or you can order directly from us by visiting our bookstore.